Certified Specialist of Wine with a five year wine distribution background and fifteen year background in commercial radio. A passion for wine that rivals Bogey and Bacall, Taylor and Burton, Romeo and Juliet....Kermit the Frog and Miss Piggy... Available for consultations, private in-home and corporate tastings/parties, and educational seminars. Check out Corked Cowgirl on Facebook, Twitter, LinkedIn, and YouTube! "Plain Ol' Wine Advice... No Bull!" Biography: Inspired by her mother and friends whose only wine experience came out whichever box was the cheapest, her goal is to prove that anyone and everyone CAN, and SHOULD enjoy a FINE wine...at GREAT VALUES! It doesn't have to be expensive, nor stuffy, nor complicated...and she will prove it to the world, one wine drinker at a time, one tremendous bottle at a time. Whether you're a wine pro, or a wine novice, you're sure to find something to enjoy within her reviews. So pop a cork, pour a glass, kick your feet up, and get ready to enjoy a little company...cheers! It happens without fail that, at least once a month, I run into it at a tasting event. Heck, I’ve even done it myself in the past. But in the past month alone (TWICE just yesterday), I’ve come across the “I don’t like (insert Cab Sauv, Merlot, Chardonnay, etc here) because it’s too (insert ONE descriptor here…”too fruity, too thin, too buttery”, etc). And typically I just hide gritted teeth behind a thin smile and say, “Really? How unfortunate. Have you tried every single wine made with that same grape?”, knowing that the cynicism has just passed unnoticed by them, much like the complexity of the wine they were currently tasting has passed unnoticed by their tastebuds as they guzzle whatever free pour has been placed in front of them. Sometimes, I get the “Yes I have tried them all” to which my eyes widen and jaw drops incredulously, given that there are THOUSANDS produced…just in that ONE varietal type alone…across the globe. The standard answer I get is “No, but I know what I like and don’t like.” Do you? Do you really? At that point, I typically smile a little wider…perhaps a little too condescendingly…but not from a snob perspective…more from an “oh child, I’ve been exACTly where you are right now…and I’m about to give you the same wake up call I received years ago”. I then say, “here, try this”, not telling them what they are drinking. Blind tasting is the great equalizer and the destroyer of preconceived notions. The majority of the time, they will sip the unknown wine, sing its praises, only to be left stunned when I reveal that the wine they are currently professing their undying love for is the same varietal they were just moments earlier telling me how much they hated. Friends, as hard as this might be to swallow (pardon the pun), the majority of you are “wine bigots”. You’ve been told that each varietal tastes a specific way. You’ve been given one or two examples of that varietal that fit the profile, and you turned it into your doctrine. The problem is, wine grapes are much like people. Even identical twins aren’t exactly the same. Neither are wine grapes. A Chardonnay grown in Burgundy will NOT taste the same way as it does in Washington…or Oregon…or Australia. Even within the same area, you’ll find big differences. Let’s stick with Chardonnay for a moment: A Napa Chard isn’t going to taste like a Chard from Santa Lucia Highlands in the Central Coast. Even within Napa, an unoaked Chardonnay from Toad Hollow is going to be comPLETEly different from one of Rombauer’s oaked beauties. Both Chardonnay…both with their own wonderful merits and loyal followers…both comPLETEly on the opposite side of the spectrum from one another! See where I’m going here? What makes wine such a magical thing is that,… depending on where it’s grown, the type of clone used, the climate, the particular weather conditions of that growing season, the ripeness when picked, the oak used (or not used), the aging regimen, whether certain processes like malolactic fermentation have occurred, the vision of the winemaker, etc, etc,…it can taste completely different. Even if it is the same brand/producer, the taste can change from vintage to vintage! That’s like walking into your closet and having one pair of shoes that matches EVERY SINGLE OUTFIT YOU HAVE AND EVER WILL PURCHASE!!! Isn’t that fantastic??? My own experience came with Sauvignon Blanc (Wine industry people, don’t judge…don’t hate me..I already know…). Try as I might, for years I could not stomach the grape…mostly because I was overloaded with those big grapefruity styles from New Zealand. Although I can tell when it is varietally correct, when it has perfect typicity, the nose alone made me want to hurl, let alone the actual TASTE. California Sauvignon Blancs weren’t much better for me with lemongrass and citrus assaulting me at every turn. Still, I sojourned on, knowing that somewhere, from some producer, I would find one. Because that’s the thing…there are a bazillion to choose from if you’re willing to keep an open mind. Fortunately, I did. Not only did I discover I liked the femininity and minerality of the Loire Valley’s Sancerre and Pouilly-Fume, but just recently, I determined that I am IN LOVE with the Sauvignon Blanc Musque clone in…CALIFORNIA SAUV BLANCS (well some of them anyway)! Success!!! It is one of my favorites. I would have TOTALLY missed out if I hadn’t kept an open mind and had not just kept trying different producers and areas. It’s almost New Year’s Eve…are you ready to celebrate? One of the things I’m told each year by people is that they either “don’t like champagne/sparkling wine” or they “don’t want to pay high prices for a bubbly toast.” Let me offer a couple of suggestions. First, for those that want bubbles, but aren’t fans of the dry taste, why not try a ‘bubbly’ cocktail? A simple but INCREDIBLY delicious one requires filling a champagne flute 3/4 of the way full of your favorite champagne/sparkling wine/cava/prosecco and floating 1/2 to a full ounce of St. Germain liqueur on top. St. Germain is a French liqueur made from the Elder flower…neither too sweet or tart. For some reason when you mix it with bubbles, it turns into liquid ‘crack’ for both men and women. Add a slightly crushed blackberry in the bottom and it makes it even better. Do it with a sparkling rose and drink it all the way through Valentine’s Day. A couple of suggestions to try for bubbles that are inexpensive would be anything from Treveri Cellars out of Washington State. AMAZING wines featuring everything from Extra Brut “Blanc de Blanc” to a Sparkling Gewurztraminer. My personal favorites are the “Blanc de Blanc” Brut made entirely of Chardonnay (lovely taste of apples and bread yeast in this one) as well as their Sparkling Rose made with Chardonnay and SYRAH (gives it a deeper ruby color and a richer flavor). You can find the line of sparkling wines retailing anywhere from $15-20. Another fun option comes from Australia. Westend Estates offers their ‘Eternity’ Sparkling Cuvee made from the Semillon grape. Not your ordinary sparkler, this has flavors of toasty french bread, lemon custard, pineapple, and honey. So incredibly different and so delicious and refreshing. Be the talk of your party with this one. Prices range from about $13-17. If you truly want Champagne (and for that, we’re talking about the sparkling wines coming from the region in France that is ALLOWED to call it Champagne), but you don’t want to have to mortgage your house to do it, I’d suggest selections from Jean Michel Grower Champagne. Located in the Moussy region of Champagne (only 4 km from the famed Epernay region), they share the same Kimmeridgian soil as Taittinger. What does that mean? It means you’re getting the same sought after Champagne that you would have to sell your firstborn to afford it at about half to a third of the price. 50 year old vines, mostly Organic, the rest using Sustained growing practices, of Pinot Meunier, Chardonnay, and Pinot Noir. Delicate mousse, delicious toast…it is the most elegant gal in the room. Look for it to retail between $50-60. Celebrating in style doesn’t have to be stuffy nor expensive. So raise your glass to outstanding wines and an outstanding 2014! Hit with two winter storms, 3 feet of snow, children home from school due to ‘snow days’, and a cold wind whipping outside my window, my thoughts turned back to my trip last May to Madrid and the ‘French Riviera.’ Oh how I longed to be basking in the warmth, the beauty, and the rich, delicious flavors of the people, the wine, and the food. This winter has made me desire both comfort…and a vacation. Fortunately, I got a taste of both in my own kitchen. Nothing says comfort like a hearty beef stew, and nothing warms you from head to toe like a glass of incredible red wine. I chose to combine the two, and add a touch of ‘vacation’ into the pot by making a Mediterranean Beef Stew and pairing it with a Spanish 2010 Abadal Cabernet Franc/Tempranillo blend from Pla de Bages. The combination delivered with earthy goodness and the rich flair of flavor that only the Mediterranean can deliver in both its food and its wine. Simple yet seductive. Like so many ‘winos’ and ‘foodies’, I snapped the photo and posted it to my Corked Cowgirl page on Facebook (see the post here: Mediterranean Beef Stew and 2010 Abadal Cabernet Franc/Tempranillo ). Today I was asked to provide the recipe for the stew. Your request is my pleasure. Don’t let the long ingredient list scare you. It’s mostly spices, and it’s super easy to make. Brown the meat in three tablespoons of the olive oil in a dutch oven or 4-quart stock pot. Once it browns, turn the heat to low. Make a paste with the remaining two tablespoons of olive oil, the cumin, coriander, cayenne pepper, and salt. Dump it on the meat and toss it around to distribute the spice paste evenly. Pour yourself a glass of wine and start sipping. Add the chopped onion, carrots, mushrooms, zucchini, and minced garlic to the meat. 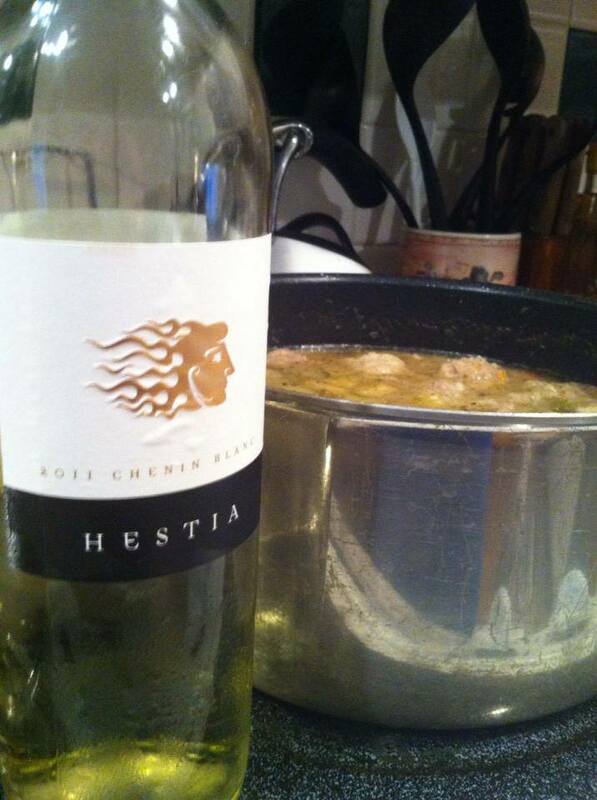 Pour the tomatoes, water, beef broth and (most importantly), the wine over the meat and vegetables. Stir it up and bring the stew to a boil. Turn the heat to low and simmer for an hour or two, or until the meat and veggies are tender. By now you should be ready for another glass (or two) of wine. While you’re waiting for it to cook, mash the garbanzo beans with a fork and begin your second glass of wine. When the stew is done (which could be whenever you run out of patience, or wine) stir in the mashed beans and spinach. Cover and cook over medium heat for 3 to 5 minutes or until the spinach is wilted(if it’s fresh) or warmed through (if it’s frozen). Sprinkle the vinegar (if you are using it) into the pot, stir up, and serve with brown rice if you want the extra carb rush. Salt and pepper to taste if necessary. You may also open another bottle of wine, if necessary. If you decide to simply sip the wine for dinner and wish to forego the stew, you’ll find the 2010 Abadal Cabernet Franc/Tempranillo for between $15-20. It is an AMAZING wine with rich fruit flavors like blackberry and plum mixed with beautiful herbal notes and even a hint of toffee. Stock up on this one to drink throughout the rest of the winter!